AVM free wheeling hubs are a quality, tough and dependable replacement for factory fitted hubs. Used to connect or disconnect the front axle assembly on part-time 4WD models, they can also be fitted to early model 4WDs that have fixed hubs to stop the unnecessary differential rotation and resulting wear. At the outer end of each front axle is a splined section over which the inner hub fits. Around the outside of this is an outer hub which is connected to the wheel. A clutch separates the two. This clutch can be engaged by oblique grooves cut inside the free wheeling hub control knob that is mounted on the outside. Turning the knob from ‘2’ to ‘4WD’ (or from ‘free’ to ‘lock’) moves the clutch so that it locks the inner and outer hubs together. Once this has been done, drive from the axle will reach the wheels. For normal ‘on road’ or hard surface usage, 4WD is not required and the hubs should be placed in the ‘free’ position. If 4WD is required or likely to be required, the hubs should be turned to the ‘lock’ position. 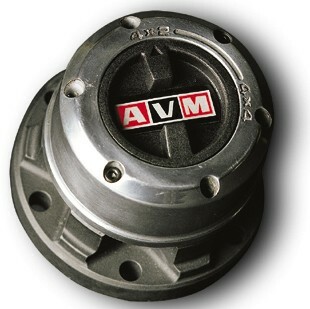 AVM hubs are easily fitted and feature a heat treated steel clutch ring for faultless torque transmitting. They are built from corrosion resistant materials and provide positive clutch ring positioning, with engage/disengage springs totally independent. ARB carries a complete range of hubs and service kits for most vehicle makes and models.